Sometimes a chair is a little loose, but doesn't want to come apart! The oak chair below had loosened up enough to need gluing, but when I tried to knock it apart to clean the joinery the chair would not budge. This is probably due to the old hardened glue lodging between the surface of the wood. I was able to open up the joints enough to get some new glue in there, but I thought it might be a good idea to reinforce the joinery with glue blocks, which this chair never had. 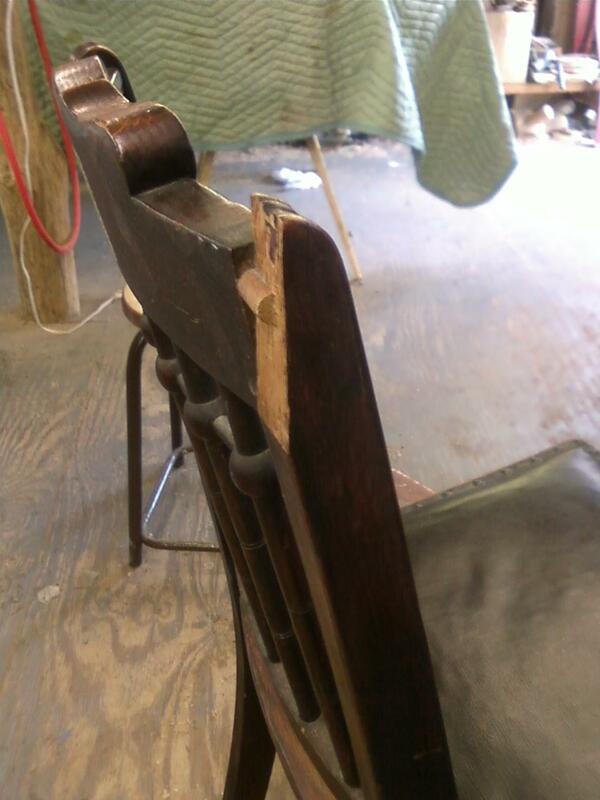 Below are some photos of the glue blocks being created and installed and the chair being glued up. the second half of this post deals with a patch on the top of the back leg of the chair. 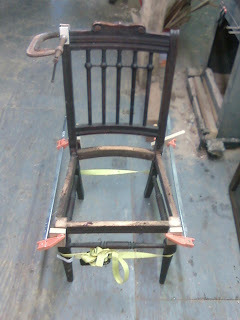 The chair with the seat removed, clamped while the new glue dries I made the new glue blocks out of oak. 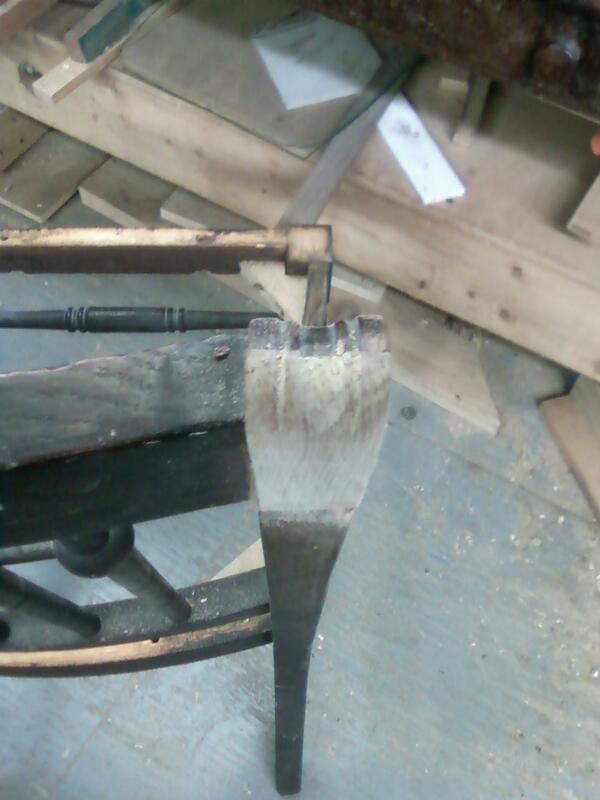 the first step was to notch out the corners to go around the back legs. then I held the block up to the chair stretchers and traced the interior shape. 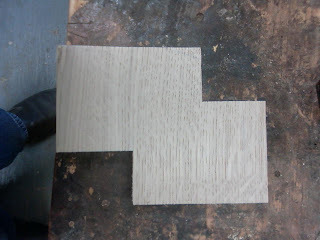 I used this block to make two glue blocks. 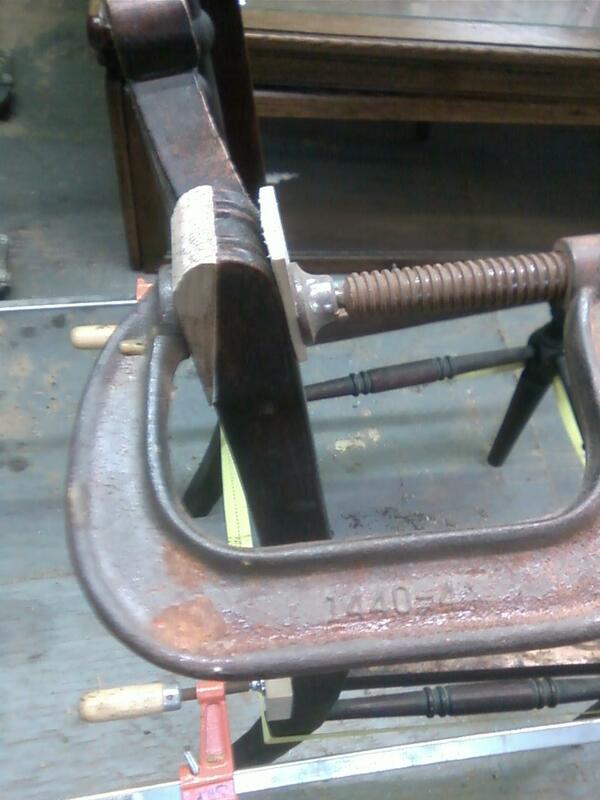 After the block was cut on the band saw I checked it against the interior to make sure it fit okay. 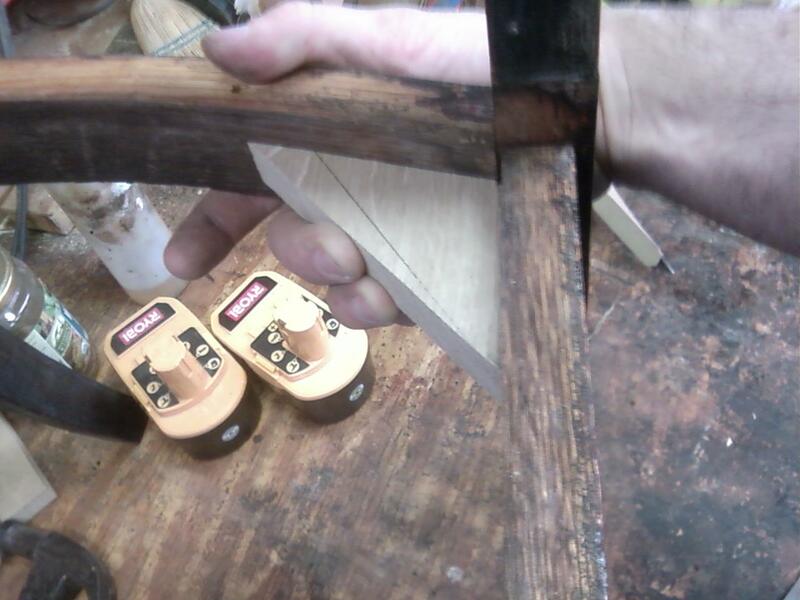 The four glue blocks being glued. 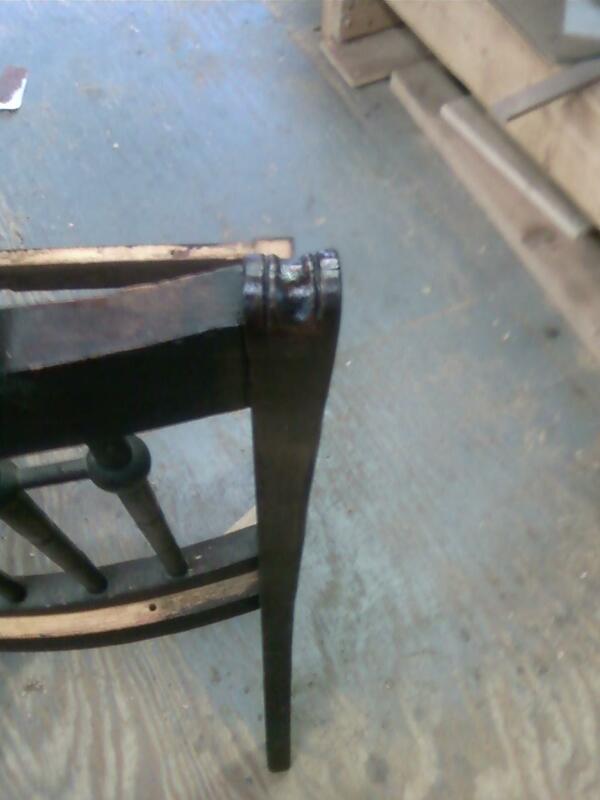 they are also held in place with screws The other problem with this chair is that it was missing a significant portion off of the top of one of the back legs. you can see the dowelled joinery sticking out. 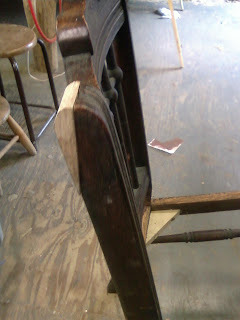 Here is the patch, after it had been roughed out on the band saw, being glued in place. 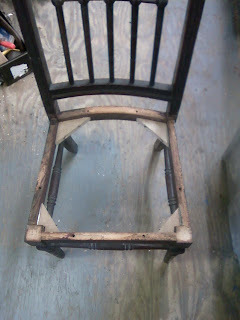 After the patch was glued, it was fine tuned using a chisel. The patch also needed some carving which I did to match the rest of the leg. 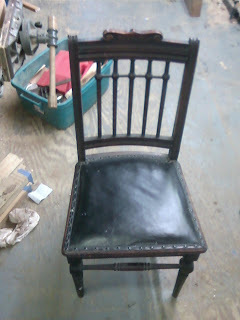 Here is a photo of the patch after it has been touched up to match the existing finish. We are really impressed and from what had been treated as a "junk chair," you have created what will be close to one of the best chairs in our home!